Enjoy Virtual Console games the way they were meant to be played. The Classic Controller blends design elements from Nintendo's classic video game controllers, such as the NES, Super Nintendo and Nintendo 64, into one comfortable control pad.The Classic Controller is connected to the Wii Remote by a short cable. The Wii Remote provides the Controller with a wireless connection to the Wii console.The Classic Controller is primarily used for playing Virtual Console games available for download from the Wii Shop Channel. 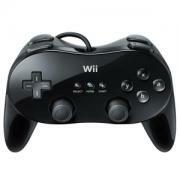 Some Wii Disc games also use the Classic Controller. Look on the back of Wii game packaging to see which games are compatible.